It’s been a few months since my last Weekend Watching recommendation but a recent rewatch of Sidney Lumet’s Network prompted me to break cover. Network (1976) is a film that remains surprisingly prescient. The narrative follows an aging newscaster Howard Beale (Peter Finch) who is on the brink of an anticlimactic retirement. His ratings are down and as everyone knows ratings are god when it comes to television. Things take a different and unexpected turn when it becomes clear that this newscaster is losing his mind. So, in essence, the beginnings of our current reality television obsession are born. Beale is put back on the air and the audience dutifully tunes in to watch an old man go mad. But in madness there is a conviction that can be both damaging and charismatic. Our challenged Mr Beale spouts some hard-hitting truths in amongst the increasingly fractured tirades. He is a man with nothing to lose and slowly he occupies a role akin to a modern day preacher. We’ve all seen born again Christians like Billy Graham vent their religious rhetoric and in Network we see something very similar but inherently different. Howard Beale is a man of the people and a man that apparently speaks ‘truth to the people.’ His truth however is not life affirming, it’s not a promise of a better life; instead it’s a didactic message and one where he bemoans the death of the individual. Network then is a film about madness but that madness is not only limited to Howard Beale. It’s exhibited by the network itself and through the ‘company men’ that purvey its wares. One of the network executives for example wants to make a show about a terrorist group with the hook being raw footage shot during the terrorist’s illegal activities. This lack of ethics is seen in Howard Beale’s treatment. An old man losing his mind is not something to celebrate or use to increase ratings – at least from a moral perspective. Taking advantage of the young, the old, or the infirm is inappropriate and completely cynical. It’s this cynicism that makes Network such an interesting film. The satire is constant and each scene is drenched in latent meaning. This seems like a world gone mad but it’s not. From a contemporary perspective Network simply reiterates the status quo, perhaps because Network is tamer than the television we’re spoon fed now. Howard Beale suggests that television isn’t the truth, that it’s a magic box full of circus performers and magicians. The television set as a concept is one that is becoming out-dated with new internet viewing opportunities. The idea of a singular medium that gives us a constant truth is much less apparent now. And there is something to be said for the idea that we are still just as passive, that we still let things slide, and that we still fail to speak our minds. Instead we spout other people’s notions as our own and we fail to actively seek out information. Howard Beale challenges his audience in just the same way that Sydney Lumet challenges us. Beale’s rallying cry is perhaps just as important today as it was forty years ago. But as with all prophets, Beale’s voice wasn’t heard and as Bill Hicks put it we always kill the good guys, the prophets. Beale told his viewers to turn off their television sets. He told them to go to their windows and shout “I’m mad as hell and I’m not going to take it anymore.” This was early interactive television and many of his viewers joined in but now audiences are much less captive, audiences have much more of a choice. Would we shout out of the window? Or just change the channel? Network is a challenging film but also one that is deeply funny. The premise is clever and dealt with well. Our reality is shaped and defined by our preachers and now with mass media being more pervasive, entrenched and saturated it seems that our teachers are those on the television screens. For every Howard Beale there are ten angry, rabid, and ill-informed Bill O’Reilly’s. The plethora of television channels has created a scenario much more dangerous and damaging than it was in Beale’s time. Now the vitriol is on every channel and it’s more cynical now than it’s ever been before. Perhaps we should just turn off the television set. Perhaps we should disconnect from the technological stream of consciousness. But if we did we wouldn’t be able to watch movies like Network, films that put into words the problems of our age and the problems that we may never have been able to express quite so eloquently. 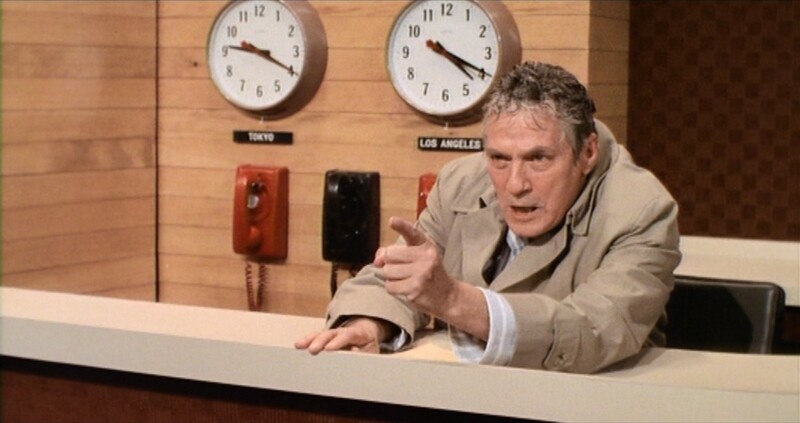 Howard Beale “the mad prophet of the airwaves” is Network’s loudest voice but it’s not the only one. Diana Christiansen (Faye Dunaway) is a programming executive who will do whatever it takes to have the best ratings on television. In actuality Howard Beale doesn’t have that much airtime and the story follows Diane and her strivings much more closely. But in testament to the power of charisma and just how well Peter Finch plays Beale, it is the messianic rants that are remembered. Beale’s voice is one that resonates and the things that he says are not easily unheard. Mass media has become our teacher and it shapes the way that we see the world. So let’s watch better films, better television, and let’s make sure that what we watch challenges us and makes us question the world around us.